Hey, Is Anybody Paying Attention? I don’t like being late for anything, though it can happen, when things out of my control happen, and in life a lot of things are out of control. Working for a corporation prior to my retirement in 2008, I made it a point of getting to meetings early and being prepared. Fumbling through papers added unnecessary stress. Legendary Green Bay Packer football coach, said to his team “if you’re on time, you’re late”. This Naperville city council does a good job at starting meetings on time. The days of dilly-dallying around are in the past. However it appears they could benefit by being more prepared; oftentimes they are futzing around with their devices or fumbling through papers while speakers are talking. Now in all fairness the city officials in the video, it’s very possible that those not seen on the peripheral edges of the dais were even more occupied futzing around with all sorts of things. It’s also very possible that the inattention was due to some sort of late-arriving communication to council members requiring immediate attention that saved all of our lives. But then again, they may have been simply ordering pizza for their after-meeting get-together, getting the Cub-Cincinnati score, checking stock prices, or catching up with their high-school buddies. If nothing else, at least give a two-second glance at the heroes who saved a life. And yes, the Cubs did win that night. Typically appointees to advisory boards don’t get much attention, discussion, or dissension. It’s about as interesting as choosing between Cheerios or Rice Krispies for breakfast. But now comes mayor Steve Chirico’s choice of Mike Isaac for addition to the Financial Advisory Board of Naperville, and just like that, a perceived issue surfaced. Isaac is the co-owner of the Petland store in Naperville. Normally this wouldn’t be an issue, but with the hot topic of puppy mills and pet stores being fought in municipalities throughout the country, including Naperville, the selection of Isaac is at best ill-timed and at worst very controversial. Here is how the dots can connect. People like puppies. Puppies can be bought from pet stores. Pet stores often purchase puppies from breeders. Some breeders, if not many, if not all, dabble in unscrupulous methods of puppy ‘care’ which are then purchased for re-sale by pet stores. Which gets back to people like puppies, many people don’t like pet stores for selling puppies, which takes us to Mike Isaac. I don’t know Mike Isaac, he might be a great guy, he might even be a Cub fan, but out of 143,000 residents in Naperville, one would think that mayor Chirico would choose someone less polarizing, or at least wait until the issue of puppies, pet stores, and breeders has finally been resolved. Chirico has been in office for 83 days. So far, he has exceeded expectations of doubters, and confirmed the expectations of supporters. So the question is, why do something that can be perceived as a negative, when he could wait for better timing, or appoint someone just as competent without controversy. Why not choose a Cheerio rather than a Rice Krispie. Every now and then I have the need to organize and simplify things. I tend to do it sooner rather than later. My family and friends believe I am obsessive-compulsive. I came to the realization they were correct while I was hanging my shirts in the closet according to the color spectrum. As an only child being raised in a one-bedroom apartment in Chicago, I was able to keep my toys exactly where I wanted them, hence it was easier to organize and find them. It worked. The new Naperville city council decided to get things better organized and simplify city council meeting procedures, when they tackled the opportunity at their June 30 city council workshop meeting.. Notice I didn’t say, ‘tackle the problem’. How could organizing and simplifying anything be a problem. The meeting consumed almost four hours, and frankly they did a great job of accomplishing their goal. Yes, I know Frank had nothing to do with it, but somebody at city hall was the instigator for spearheading this venture, and my guess is it was mayor Steve Chirico. If not, then he was the one with the most to gain by getting meetings to run on a more efficient level. It was during this meeting that the council decided to shelve Robert’s Rules Of Order, in favor of creating their own rules. After listening to that portion of the meeting, it seemed as though the new rules, though fewer, were just as difficult as ever to understand. That’s the benefit of having city attorney Jill Pelka-Wilger sitting at the dais, acting an an umpire to explain the rules. Even though city council members voted to approve the changes, I rather doubt that the majority of council members could pass a multiple choice test on new rules, hence the intensified need for Pelka-Wilger to remain near the dais at all times, and within shouting distance at the municipal center during office hours. One of the rules discussed involved citizen participation during public forum, which allows for a total of 30 minutes of time, and each speaker being allowed up to three minutes presentation time. The issue is what happens if there are speakers remaining after the 30 minutes have elapsed. Do they extend the 30 minutes to allow all to talk which could take all night, or do they keep the 30-minute limit and divide the time by the number of speakers. Hence, 60 speakers could have 30 seconds each, or just enough time to get to the podium, give their name, and get back to their seat. Followed by councilman Kevin Coyne’s support for the idea. Finally, proof that government can work, at least for this meeting. Now if the same can be said for following meetings, Watchdog can retire, and get back to organizing my pens by color, and separating my little paper clips from the big ones. In college, I took a physics class as a required course. It had nothing to do with my major. The entire class consisted of kids in the same situation. The professor lived and breathed for physics. The course book was the size of a Chicago phone book with the smallest font possible. After the first test, which everyone failed, the professor realizing he wasn’t teaching students majoring in physics, chose a different textbook, one matching our need to understand physics, which was nearly non-existent. The new book had large font, lots of pictures, and few pages. Perfect for me. I felt tremendous accomplishment earning a solid C- as my final grade. Now comes news that the Naperville city council wants to replace Robert’s Rules Of Order with their own set of rules and procedures. As a ‘Robert’ myself, I am personally offended by this assault on anything named ‘Robert’. It’s not Frank’s Rules of Order, or Ginger’s Rules of Order. It’s Robert’s. It’s been around since 1876. It’s been refined 11 times over the years. It took that long to finally get it right, and now the Naperville city council wants to throw it in the dumpster and be done with it in favor of creating their own rules and procedures. So the Naperville city council is actually admitting that they don’t understand parliamentary procedures because they are too complex, and worse yet, they don’t have the desire or capacity to learn procedures that have been used for 140 years. Are we left to believe that previous Naperville city councils were brighter, wiser, and smarter than this group. I get it that trying to understand the difference between a subsidiary, privileged, and incidental motions is not easy, but it wasn’t easy for me to learn how high a golf ball will bounce off of a marble floor. And it might be difficult for our council members to know the difference between ‘lay it on the table’, ‘place it on the table’, or ‘take it from the table’; and where exactly is the table? Nobody said it would be easy becoming a council member, but it wasn’t easy for me to figure out how far a bowling ball would roll down a hill on a hot, humid day in August, but I did it, at least until I took the test. Just as I signed up for a major with required classes, council members campaigned for office knowing Robert’s Rules Of Order were part of the deal. I don’t need to know how fast a train will accelerate going down a two-mile hill without brakes, unless of course I am on that train. Naperville council members can’t walk away from something just because it’s difficult. They need to make the effort to learn the ‘tools of their trade”. I’m sure it’s difficult for most presenters during public forum to speak up, but they do it. The only thing I remember learning in my physics class was, ‘how far can a grasshopper with a wooden leg kick a pancake into the forest?’ The answer is ‘half-way, because then he begins kicking it out of the forest’. That’s it. My folks would have been proud knowing that they paid part of my tuition for that. The council can’t give up on ‘Robert’. There may come a time when they wish they had ‘Robert’s Rules Of Order’ for a procedure they hadn’t planed on.I wish I would have learned why it is that when I drop anything, it always rolls under something. It looks like the majority, six or seven, Naperville city council members are hooked on e-cigs. They can’t let them go. Mayor Steve Chirico along with possibly councilmen Kevin Coyne and Kevin Gallaher realize it might be better to back off e-cigs, but two or three does not make a majority. We’re talking about the council’s thirst to regulate e-cigs with an ordinance. When the topic was first on the agenda about a month ago, two councilmen (Gallaher and Hinterlong) let it be known that they didn’t know much, if anything, about e-cigs, but councilman Paul Hinterlong was all too willing to regulate them. We also learned that council members Becky Anderson and Patty Gustin were eager to vote on the issue, rather than wait for the Illinois General Assembly to weigh-in on the topic. Neither Anderson or Gustin were open-minded to hear additional information on the topic. Apparently for them, the discussion was over. It seems to be a common denominator for the majority of this Naperville city council, that ‘discussion is over’, whether it be this topic or other topics. Apparently some council members don’t want to be bothered with additional information. Don’t let facts get in the way. Just vote on it (whatever it is) and be concerned about details later. Details include the foolishness of trying to enforce the ordinance. This is where it gets tricky. Maybe the e-cig is not a nicotine delivering device though it may look like one, or maybe the e-cig device is a nicotine delivery system prescribed by a doctor to help people get off the addiction of smoking. The City of Naperville has been guilty of the addiction of over zealous prosecution of not-well thought-out ordinances. Some members of this Naperville city council need an ‘e-cig ‘ to break this foolish addiction. When you are thinking of driving into downtown Naperville do you think twice about it? Do you look at the clock and base your decision on the time of the day, or the day itself? Or how about this, do you catch yourself thinking about going elsewhere to get what you need or want, rather than downtown Naperville? I do all the above. I’m retired, though I look at myself as being on a permanent, unpaid suspension, so you would think I have all the time in the world to get from point A (home) to point B (somewhere in downtown Naperville). I do have time, but I don’t relish sitting in traffic or crawling through Washington street. When I lived in Barrington, I gave up going to Woodfield Mall; traffic and parking was miserable. I moved to Naperville in 1978, and years ago, I gave up going to Fox Valley Mall (now Westfield Mall) for the same reason. Shortly after that I began to avoid anything on Rt. 59. Now with downtown Naperville becoming more dense, my sphere of mobility is shrinking even more. I’ve determined that for me the best time to venture into downtown Naperville is Tuesday through Thursday from 10:22 am to 10:44 am. Living in the southeast part of town, I utilize Weber road for wants and needs, along with Boughton road towards I-355. 75th and Naper is pretty good, but venturing north on Washington turns into a dismal, slow motion adventure. I was in downtown Naperville last Wednesday at 10:30 am. I picked up what I needed (actually wanted) and left driving south on Main street. I noticed a sign showing a picture of the new Water street project, then I noticed the beginnings of the project being built (how could I miss it). The picture looked cool, but the reality of the project’s density gave me the heebee-jeebies. There’s a term you don’t hear much anymore. Imagine that soon-to-be high density area, along with downtown traffic congestion on a Rib Fest or Last Fling weekend. There won’t be much room to move. 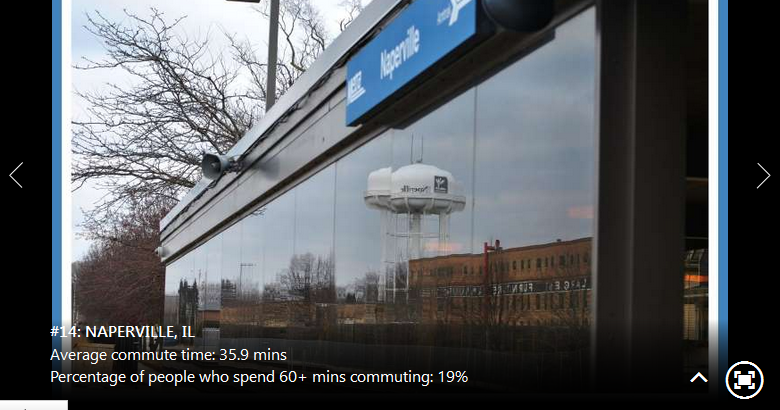 Naperville was recently profiled as the 14th worst traffic commute. That’s amazing. How did Naperville avoid not cracking the Top-Ten. We surely will when The Project is completed. Could it be that we could surpass Chicago or Los Angeles. The odds are good that sooner or later it will happen if city officials keep increasing density without addressing traffic flow. City officials took a huge step (not) when they worked up the courage to eliminate a few parking spots on Washington, as if that would make a difference. That’s like the Titanic slowing down the sinking process by tossing a few deck chairs off the ship. If the Naperville city council wants to make a statement about improving traffic flow in the downtown area, they can start by eliminating all parking on Washington street. The merchants may whine and cry, but the traffic will flow. The City of Naperville’s legal department enjoys dragging residents into court. Can you blame them. It’s job security. The City will be back in court on July 8, but this time not as a plaintiff; the City will be a defendant. You won’t find it on the City’s website or in Naperville’s “Connected” newsletter. City officials don’t like broadcasting court situations, though they are the ones creating most of those situations. Win or lose, it’s not the city official’s money they are wasting, it’s tax dollars from residents and businesses that city officials are squandering. If city official’s were held financially responsible and accountable for their actions, chances are very few situations would result in court action. This lawsuit was filed by a group of Naperville residents (Naperville Smart Meter Awareness Group) over the forced installation of about 57,000 not-so Smart meters on homes and businesses throughout the city. City officials bullied residents when police escorts accompanied installers with the threat of arrest. Some residents were arrested, handcuffed, and tossed into squad cars, and booked. In some cases charges were wisely dropped by the City, however in another case (Kim Bendis), the City used every possible tactic to destroy the Naperville resident in court action. The City lost the case in court when the good guys won and Kim Bendis was acquitted last October. Now the City of Naperville takes a turn as the defendant. On July 8th, the court will rule on whether or not to accept a third amended complaint. Either way, the court did not dismiss an equal protection claim regarding Smart Meter Awareness group members being dealt with differently than non-members of the group in terms of keeping an analog meter. That claim will go forward. The group’s attorney, Doug Ibendahl, said members simply wanted the opportunity to keep their original analog meter without additional fees being levied on the request. Naperville city officials had the opportunity to do the right thing, allowing residents a choice, and thereby keeping it out of court, and they didn’t have the wisdom to do it. Hence court action against the City. Why must Naperville city officials make things more difficult than they need to be. The three current city council members who were influential in letting things get out of control were then sitting council members Judy Brodhead and Paul Hinterlong, along with then Smart Meter ambassador (city council mouthpiece) John Krummen who now sits on the council. It’s always nice when the good guys win in court. It happens on Judge Judy. It happened with Kim Bendis. When the Naperville Smart Meter Awareness group wins, that qualifies for the Triple Crown of winners.